I’m cross-posting my latest blog from my other spot. I hope you enjoy it! This is a repost of a blog I wrote last year, and I’m hoping to include more posts in my Black History Month series this month. I’ve started with my chosen family instead, and I’d like to think that if I had a Black gay dad, it would be Brother Baldwin. His influence on me has been immeasurable, from Notes on a Native Son to If Beale Street Could Talk. My predilection for essay writing can be directly attributed to Baldwin, as well as my desire to always speak my truth to power. If Beale Street Could talk was one of the first “grown up” novels I read as kid. I think I was 15 or 16 when I read it, and what I remember most about this experience was that I was told by my English teacher that I couldn’t do a book report on this novel because it wasn’t on our list of approved readings. Nor were any of the other texts by Black authors that I wanted to read. That upset me, and stubborn child that I was, I did it anyway and dared her to fail me, knowing already that I was one of her best students. She didn’t, and thus my reputation as being “radical” was born. They really had no idea, nor did I, how far that one little act of defiance would take me. Either way, I love this book and I was able to read it again a couple of years ago when I was studying for my Ph.D. exams. If you know anything about Baldwin, you know his novels are emotional, thought-provoking, and gut-wrenchingly honest, especially in regards to Black experiences in urban America. This novel is no different, and reading it reminded me of how spot on Brother Jimmy was about all things America. The other thing it did this past year was remind me of how little has changed in American society in regards to the incarceration of so many Black men, as well as the ways in which Black communities are still struggling to save all of our children from the legacy of slavery and white supremacy in this country. 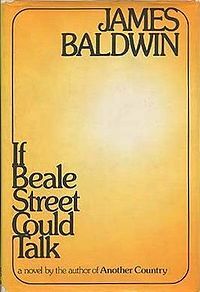 If Beale Street Could talk was one of the first “grown up” novels I read as kid. I think I was 15 or 16 when I read it, and what I remember most about this experience was that I was told by my English teacher that I couldn’t do a book report on this novel because it wasn’t on our list of approved readings. Nor were any of the other texts by Black authors that I wanted to read. That upset me, and stubborn child that I was, I did it anyway and dared her to fail me, knowing already that I was one of her best students. She didn’t, and thus my reputation as being “radical” was born. They really had no idea, nor did I, how far that one little act of defiance would take me. Either way, I love this book and I was able to read it again last year when I was studying for my Ph.d. exams.